This type of issue is mainly faced in Dedicated or VPS or Cloud hosting servers with low memory. We will discuss the reasons of facing this type of issue as well as rectifying it. We at HostingRaja wants to give our clients to experience the best services. This type of issue results in unwanted behavior of the server. For each of the processes, services running on the server requires certain set of resources to feed. When the number of processes/requests increases and the allocated resource fails to serve it typically hangs the server by trying to kill the concurrent processes. You can find out the messages using the command dmesg or /var/log/message. You can grep for the word “out of memory”. If you find any such a error message, then most likely your dedicated or Virtual server is running out of memory. 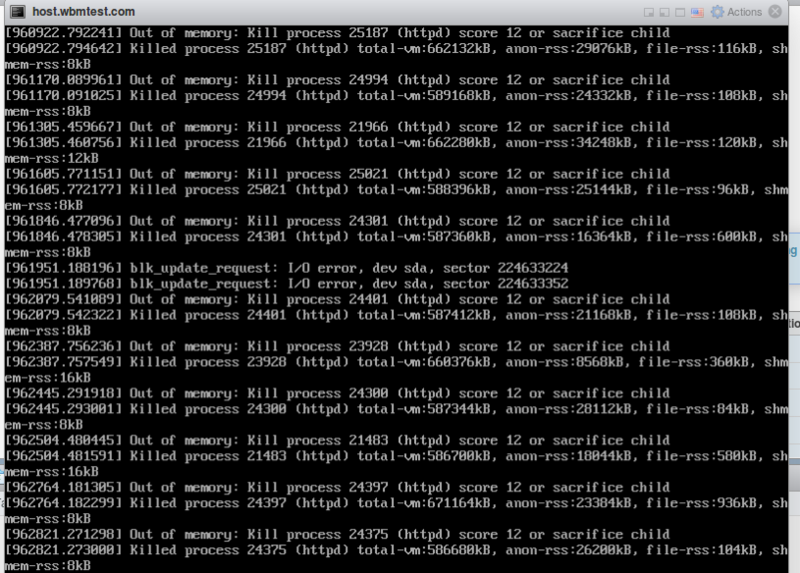 Out of memory : kill processes 648945 httpd (score 12 ) or sacrifice child. The above lines clearly illustrates that the issue is fed with the memory resource of the server. In the above mentioned image you can see that the server is trying to kill the concurrent processes to overcome the issue. This results in shutdown of the server as it also considers some essential services on the server. You have to upgrade the RAM, to higher plans. Suppose if you are in 8GB RAM, then you can try upgrading to 16GB RAM. This type of issues are generally resolved with the upgradation to the higher plan that will come in pack with the higher resources. We have got plenty of affordable options by which you can resolve this issue permanently. You can contact support team which is available 24X7 and they will make sure that your request is process within no time. Note: This issue can happen in Java Hosting servers too, As Java requires lots of RAM memory to operate. You can reboot the server, If you keep getting again and again, then you should consider upgrading the plan. You can find out, Which process takes more memory. For example, If your MySQL server takes more memory, then you can optimise the mysql server. If have more emails queued in the server also, you can get this error message. Spread the load of the servers to multiple servers. Like you can have a server specifically to serve all web request, Where only ngnix or apache server will be running and have a separate server for DB (database), This way, you can avoid this problem.